Emulsified Vegetable Oil (EVO) is commonly added as a slowly fermentable substrate to stimulate in situ anaerobic bioremediation. This article summarizes information about EVO transport in the subsurface, consumption during anaerobic bioremediation, and methods for effectively distributing EVO throughout the target treatment zone. Post-Remediation Evaluation of EVO Treatment – How Can We Improve Performance? Emulsified Vegetable Oil (EVO) is commonly added as a slowly fermentable substrate to stimulate the in situ anaerobic bioremediation of chlorinated solvents, explosives, perchlorate, chromate, and other contaminants. However, effective treatment requires that EVO be distributed throughout the target treatment zone to optimize microbial growth and therefore contaminant degradation. Figure 1. Photo-micrograph of EVO (0.7 µm median diameter). White scale bar 25 µm. EVO is most commonly purchased from a commercial supplier and shipped to the site as a concentrated emulsion containing 45 to 60% vegetable oil. These factory prepared emulsions are generally stable but do have a finite shelf-life (typically several months), which can be can be significantly shortened by extremes in storage temperature. Soybean oil is commonly used because of its availability, good handling characteristics, and relatively low cost. The oil provides a slow release organic substrate to support long-term anaerobic activity. The remainder of the EVO formulation consists of: (a) more readily fermentable soluble substrates (e.g. fatty acids or alcohols); (b) surfactants to reduce oil droplet interfacial tension, stabilize the emulsion and reduce oil droplet flocculation; and (c) water. The soluble substrates are first used by bacteria to reduce other terminal electron acceptors (oxygen, ferric iron, sulfate etc) and generate rapid, initial growth of the required bacteria. In some cases, additional nutrients are added to enhance microbial growth including nitrogen, phosphorus, yeast extract, and vitamin B12. The median oil droplet size of factory prepared emulsions is commonly in the range of 0.5 to 2.0 µm, which provides emulsion stability during shipping and also improves transport through typical aquifer materials (Figure 1). Some product vendors provide more concentrated EVO products containing oil and surfactant that do not contain water to save on shipping costs. These products must be emulsified in the field by adding water and mixing. Typically, these field prepared emulsions are not as stable as factory prepared emulsions, and often have much larger oil droplets. Once injected, the oil droplets are transported through the aquifer pore spaces by flowing groundwater. Experimental and mathematical modeling studies by Soo and Radke have shown that oil droplets larger than the sediment pores are rapidly removed by straining with a large, permanent permeability loss. The median pore size of sand aquifers is typically over 100 µm which is orders of magnitude greater than the oil droplet diameter (< 2 µm) of factory prepared emulsions, so physical straining is not a significant retention mechanism in sands. However, field prepared emulsions often have larger oil droplets, so physical straining of the large droplets can be significant. Common factory prepared emulsions are retained by aquifer material when the small oil droplets collide with sediment surfaces and stick (referred to as interception). Retention of small oil droplets (diameter < 2 µm) by aquifer material can be described by deep-bed filtration theory where droplet capture by the sediment surfaces is a function of: (1) the frequency that droplets collide with sediment surfaces; and (2) the collision efficiency, which is the fraction of droplets colliding with the sediment surfaces that are actually retained. Figure 2. Animation illustrating oil droplet transport and retention in porous media. Collision frequency between oil droplets and sediment surfaces depends on groundwater flow velocity (advection), Brownian motion (diffusion), and gravitational settling or floatation. Very small droplets vibrate rapidly due to Brownian motion, resulting in frequent collisions with particle surfaces and rapid removal. Large droplets float, colliding with the roof of the sediment pores, increasing removal. For vegetable oil emulsions at typical groundwater velocities, the lowest collision frequency occurs at a particle size of 0.5 to 2 µm. Collision efficiency varies due to a variety of factors including pH, droplet and matrix grain surface coatings, ionic strength, surface roughness, sediment surface charge heterogeneity, and blocking of the sediment surface with previously retained droplets. Oil droplets and sediment particles typically take on an electrical charge and are surrounded by a double layer of charged ions. When both the oil droplets and sediment surfaces have a negative charge, the oil droplets tend to be repelled by the sediments, reducing oil retention by the sediments. When the oil droplets are negatively charged and the sediments are positive or neutral, the oil droplets are more likely to stick and be retained by the sediment. As a dilute emulsion containing millions of negatively charged oil droplets migrates through the aquifer pore spaces, it encounters some positively charged locations. If the oil droplet ‘bumps into the sediment’ at that location, the droplet will likely stick and fill up that site (Figure 2). Additional oil droplets will be repelled by the attached droplet and migrate further through the aquifer, gradually filling up the available attachment sites. In this way, the emulsion gradually saturates the available attachment sites and continues to migrate with the flowing groundwater. The maximum amount of oil that can be retained by an aquifer is a function of the oil droplet properties (diameter, surface charge), chemical characteristics of the sediment surface (e.g., presence of organic or iron oxide coatings), and surface area available for droplet attachment. Sediments with a high clay content are expected to have a higher maximum oil retention because of the greater surface area and number of sites available for oil droplet attachment. Fine grain sediments will also have smaller pores, so physical straining of oil droplets becomes more important. Zeta potential and maximum oil retention were measured in sediments from two sites (SA17 Zone B and OU2) using either deionized water (DI water) or a solution of 200 mg/L CaCl2. In DI water, the zeta potential of the EVO (EOS 598B42) was -43 mV indicating good stability, while the zeta potential of the soil varied from -20 to -30 mV indicating incipient instability (Table 1). However, in the CaCl2 solution, zeta potential of the soils and emulsion were much closer to zero indicating rapid flocculation. The much weaker repulsion of the oil droplets by the sediment particles in the CaCl2 solution resulted in a large increase in maximum oil retention (Table 2). These results are consistent with the common practice of adding multivalent cations to water treatment systems to reduce zeta potential and enhance flocculation of suspended particles. In general, trivalent cations (Fe+3, Al+3) are more effective flocculants than divalent cations (Ca+2, Mg+2, Fe+2, Mn+2), which are more effective than mono-valent cations (Na+, K+). These results demonstrate that dissolved cation concentration (Na+, K+, Ca+2, Mg+2, Mn+2, Fe+2) can have a major impact on zeta potential and oil retention. High concentations of dissolved cations will occur naturally in aquifers with high total dissolved solids (Na+, K+) or with carbonate minerals (Ca+2, Mg+2). In situ bioremediation can increase cation concentration by release of dissolved Mn+2 or Fe+2 and by addition of alkaline materials (NaHCO3, Mg(OH) 2), if needed to raise pH. Detailed laboratory column, sandbox, and field studies have shown that EVO can be transported substantial distances through fine silty or clayey sand and fractured rock  . However, once oil droplets attach to soil surfaces, they are strongly retained and do not migrate further. Much effort has focused on developing EVO formulations with low retention to reduce the amount of oil required to treat a given volume of aquifer. However, in some cases, higher oil retention is required to treat very high permeability gravels or fractured rock. In these cases, EVO with large oil droplets can be used. The large droplets increase oil retention by straining and by oil droplet buoyancy which causes the large droplets to collide with the roof of the sediment pores. Shortly after injection, most oil droplets are immobilized on sediment surfaces. The soluble substrates are rapidly consumed during reduction of background electron acceptors (oxygen, nitrate, manganese, iron and sulfate). The oil (triglyceride) is fermented to hydrogen and acetic acid through a two-step process where the ester linkages between the glycerol (an alcohol) and the long-chain fatty acids (LCFAs) are hydrolyzed releasing free fatty acids and glycerol to solution. Glycerol is very soluble and relatively easy to biodegrade, so this material is quickly consumed releasing 1,3-propanediol and then H2 and acetate. The LCFAs undergo further breakdown by beta-oxidation releasing hydrogen (H2), one molecule of acetic acid (C2H4O2), and a new acid derivative with two fewer carbon atoms. By successive oxidation at the beta carbon atom, long-chain fatty acids (LCFAs) are whittled into short chain fatty acids (SCFAs) and acetic acid. Four hydrogen atoms are released from saturated fatty acids for each acetic acid unit produced. Unsaturated fatty acids undergo the same general process, but release two atoms of hydrogen for each acetic acid unit. Microcosm, modeling, and field studies by Tang et al., and Watson et al  indicate that the LCFA consumption rate, and associated H2 and acetate production rate, is controlled by LCFA solubility. LCFAs have a relatively low aqueous solubility and will precipitate in the presence of divalent cations (Ca+2, Mg+2, Mn+2, Fe+2) or sorb to clay, reducing their bioavailability and fermentation rate. Since LCFA precipitation/sorption is an equilibrium process, a portion of LCFA will be in the aqueous phase and available for fermentation. The short chain fatty acids are much more soluble and sorption/precipitation of these materials is not a significant factor. Immediately adjoining the precipitated LCFAs, H2 and acetate will be produced, and aquifer redox conditions will become sulfate-reducing to methanogenic with H2 varying between 1 and 10 nM and acetate varying between 105 to 107 nM (6 to 600 mg/L). H2 concentrations are maintained at low levels by rapid consumption of background electron acceptors or chlorinated solvents. If the chlorinated solvents and other electron acceptors are depleted in the area immediately adjoining the LCFAs, H2 will be fermented to CH4 and will no longer be available for enhanced reductive dechlorination (ERD). In contrast, acetate turnover is much slower, and dissolved acetate can migrate with flowing groundwater, eventually reaching contaminated portions of the aquifer, stimulating the reduction of PCE, TCE and other more highly chlorinated compounds. However, cDCE and VC are only efficiently degraded by Dehalococcoides spp. which require H2 as an electron donor. Since elevated H2 levels only occur near where LCFAs are being fermented, cDCE and VC will only be reduced to ethene in close proximity to the precipitated LCFAs. Given that the contaminant distribution in the aquifer is almost never known, the best approach is to distribute EVO as uniformly as possible throughout the target treatment zone. There are a variety of different approaches that can be used to inject emulsions in the subsurface including: (a) injection only using grids of temporary or permanent wells; (b) recirculation using systems of injection and pumping wells; and (c) barriers. Each of these approaches has advantages and disadvantages with the ‘best’ approach dependent on site-specific conditions. For each approach, cost and effectiveness are a function of the well layout and injection sequence. 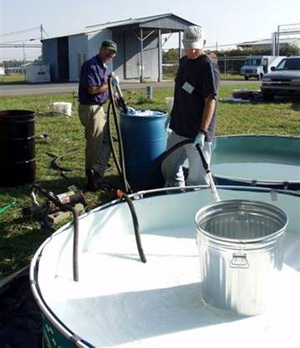 Projects involving injection of oil emulsions typically, but not always, involve the following steps: (1) installation of injection wells and associated equipment; (2) preparation or purchase of a concentrated emulsion; and (3) dilution of the concentrated emulsion with water and (4) injection. Emulsions can be injected through the end of direct push tools, through temporary direct-push wells, or through permanent conventionally-drilled wells. The selection of the most appropriate method for installing injection points depends on site-specific conditions including drilling costs, flow rate per well, and volume of fluid that must be injected. Using properly prepared emulsions, it is possible to move injected emulsions 10, 20, or in some cases even 50 ft away from the injection point. However, achieving effective distribution of the emulsified oil often requires injecting large volumes of water. Depending on the injection well layout and formation permeability, emulsion injection can require an hour to several days per well. For greater efficiency, several wells may be injected at one time using a simple injection system manifold. 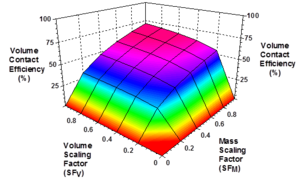 Modeling studies by Clayton and Borden (2009) showed that EVO distribution throughout a target treatment zone is controlled by: (1) injection point spacing; (2) mass of oil injected relative to the maximum oil retention capacity of the treatment zone (Mass Scaling Factor, SFM); (3) volume of dilute emulsion and/or chase water injected to distribute the emulsion relative to the total treatment zone pore volume (Volume Scaling Factor, SFV); and (4) timing of injection into different wells. If too little oil is injected or too little fluid is injected, the oil will be retained by the sediment close to the injection wells and large portions of the aquifer will remain untreated. Figure 4 shows the effect of SFM and SFV on volume contact efficiency (the fraction of treatment zone contacted) for a moderately heterogeneous aquifer treated with a uniform grid of injection wells. For SFM> 0.4 and SFV>0.4, contact efficiencies greater than 50% can be achieved. However, contact efficiencies greater than 70% are very difficult to achieve due to the spatial variations in permeability common to most aquifers. Figure 4. Effect of volume scaling factor (SFV) and mass scaling factor (SFM) on volume contact efficiency for a moderately heterogeneous aquifer with well spacing approximately equal to row spacing. Designing an effective and efficient injection system is challenging due to the trade-offs between cost and performance. In general, closer well spacing with more oil and more distribution water will improve contact efficiency, but also increase costs. There are also trade-offs between costs for injection point installation and labor for fluid injection. Increasing the separation between injection wells will reduce the number of wells, reducing drilling costs. However, a larger well spacing can also increase the time required for injection, increasing labor costs. An Excel spreadsheet-based design tool (users guide and readme) is available to assist in developing efficient and effective injection systems. Once the well spacing and injection volumes are selected, there are two basic approaches to injecting emulsions: (1) injection of a small volume of more concentrated emulsion (typically 10 to 20% oil by volume) followed by additional chase water to distribute the emulsion throughout the formation; or (2) continuous injection of a more dilute emulsion (typically 0.5 to 2% oil by volume). Numerical modeling results indicate that the two approaches are both effective in distributing emulsion and the choice should be based on personal preferences and site logistics. In all cases, the concentrated emulsion should be diluted with enough water to reduce the viscosity to near that of water, reducing injection pressures. After emulsion injection is complete, clean water should be injected at the end to push mobile oil out away from the injection point to reduce well fouling with bacteria and oil. Emulsified Vegetable Oil (EVO) is commonly added as a slowly fermentable substrate to stimulate in situ anaerobic bioremediation. Commercially available EVO typically contains a mixture of 45 to 60% vegetable oil present in small (0.5 to 2.0 µm) droplets, more readily fermentable soluble substrates (e.g. fatty acids or alcohols), surfactants, nutrients and water. Oil droplets are retained by aquifer material when they collide with sediment surfaces and stick (referred to as interception). The tendency of oil droplets to stick to aquifer material varies due to a number of factors including pH, droplet and matrix grain surface coatings, ionic strength, surface roughness, sediment surface charge heterogeneity, and blocking of the sediment surface with previously retained droplets. Following injection, the vegetable oil is hydrolyzed to glycerol and long-chain fatty acids (LCFAs), which are subsequently fermented to hydrogen (H2) and acetate. The rate of LCFA fermentation and resulting H2 production is limited by sorption to sediment surfaces and/or precipitation with divalent cations (Ca+2, Mg+2, Mn+2, Fe+2). Since H2 is rapidly consumed near where it is produced, the oil droplets should be distributed as uniformly as possible throughout the target treatment zone. This involves injecting sufficient EVO and sufficient water to distribute the EVO throughout the treatment zone.